Your family is important to you. 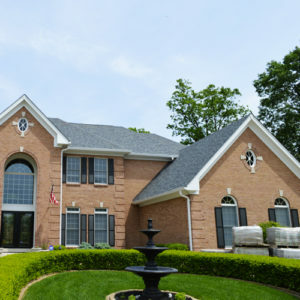 Whether your family involves your significant other, your kids, or your pets; the people that matter most to your deserve a safe space to come home to after a long day at work or school, and residential roofing plays a significant role. Without a roof over your heads, you and your family are exposed to rain, sleet, snow, and the hot summer sun. A roof offers some of the most basic yet vital protection, keeping your home – and all of the memories within it – safe from the elements of the natural world. That is why it’s so important to choose qualified residential roofers, like John Beal Roofing, who can get the job done professionally and affordably. When you reach out to John Beal Roofing, we’ll come out and assess the needs of your home. Is there damage that was done to your roof, or is it simply time for an upgrade? The answer to this question will have an impact on what we suggest. Your John Beal contractor will also examine the surface of your roof, as well as the surrounding area. This means we’ll not only be looking at your home but the entire property, noting any possible complications or hazards. Examples of other types of environmental factors might be trees or the weather your home is likely to experience. If we see something that might affect the installation or the lifespan of your roof, we’ll provide you with this information, so you can make an informed decision about your new residential roof. After observing your roof, we’ll talk to you about specific needs or preferences you might have for your roof. At John Beal Roofing, we prefer to work closely with our customers, so we can understand their goals for the project and deliver the best service possible. If you don’t know what the customer wants, how can their roofing project be a success?! When you choose John Beal, we’ll work together to determine the best residential roofing solution available to you. This will largely be determined by what you want your roof to do for you! Do you want a functional and affordable roof? One that’s tough but still aesthetically pleasing? Or maybe your biggest need is a roof that will require little maintenance and last a lifetime? Your contractor can help you find which type of roofing will meet your needs; whether that’s asphalt, slate, metal, or something else entirely! With your roofing material chosen and your roof assessed, your John Beal Roofing contractor will be ready to provide you with a quote. We provide all of our customers with a FREE estimate, backed by our John Beal Low Price Guarantee! This guarantee is a promise to every one of our potential customers: if you’re able to find a cheaper estimate of equal value, we’ll match it! If we can’t match it, then we will pay you $100! It’s a win-win for our customers, making a call to John Beal Roofing a no brainer! See offer to learn more about our John Beal Low Price Guarantee!